Athlone IT Students’ Union presented a celebration of Positive Mental Health last week at an event opened by Professor Ciarán Ó Catháin, Athlone IT president. The event hosted by the Students Union invited students and staff to celebrate with them their achievements and national awards earned over the past year. The Students Union-led campaign Mind Your Mates won ‘Best Mental Health Campaign’ of the year alongside achieving the national Amber Flag award for Positive Mental Health. Students took centre stage in an event which was co-hosted by the AIT Please Talk Society, a student-led group who host a number of fundraising events throughout the year for different mental health charities. 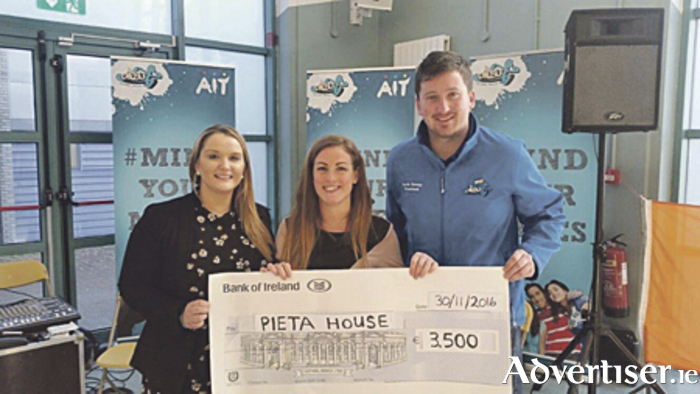 The group, alongside the Students Union, presented cheques to the value of €4,500 to Pieta House and €1,000 to Jigsaw respectively. Members of the society took the lead in telling their stories of mental health issues and how they came through the other side of them and are now encouraging others to talk about their situation. Assembled students were given exam tips by Donna Mulkerrins, deputy president of the Students Union, as they approach the exam period. Head councillor for AIT, Treasa Fox, spoke about the tremendous community effort that has been made over the past number of years to bring mental health matters to the forefront and how the increased promotion has resulted in an increasing number of students using the available services. The Students Union and students formally presented their fundraising efforts to the AIT counselling service with a cheque for €5,200. Students Union president Kevin Ronan said that they hope to continue their fundraising efforts over the course of this year, with a particular emphasis on their chosen charity for the year.